Loneliness and social isolation are already problems for many seniors. The film Robot and Frank imagined a near-future where robots could do almost everything humans could. The elderly title character was given a “robot butler” to help him continue living on his own. The robot was capable of everything from cooking and cleaning to socialising (and, it turned out, burglary). This kind of science fiction may turn out to be remarkably prescient. As growing numbers of elderly people require care, researchers believe that robots could be one way to address the overwhelming demand. But while robots might be able to provide care and, in some cases, social interaction, many wonder if they really are the right solution to this uniquely human issue. One recent survey found that while 68% of people agree robots are beneficial because they can help people, only 26% surveyed said they’d be comfortable with a robot providing help and companionship for them if they were in hospital or care. Commentators in the media have also echoed these concerns, with some even arguing that robots can’t provide those living in care with the empathy and altruism that human caregivers do. Loneliness and social isolation are already problems for many seniors and are even linked to cognitive decline and a higher death rate. With the population of seniors expected to rise, many worry that experiences of loneliness will increase, especially if access to care is even more limited. 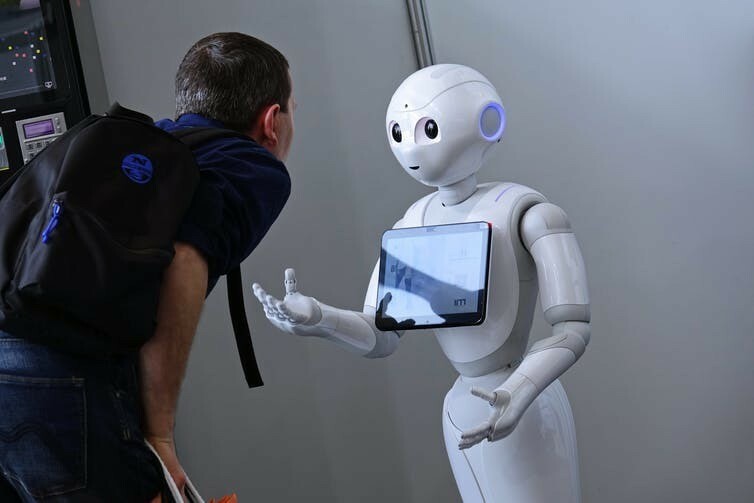 But despite concerns, early studies already show that social robots – autonomous robots trained to interact and communicate with humans – really could address issues of care and social interaction. The majority of robotics researchers are largely in favour of introducing robotic technology on a wider scale and believe it could reduce loneliness and increase independence in elderly patients. The Japanese government even supports introducing robots in care homes to solve the country’s ageing population problem. However, many strongly recommend carefully balancing the care benefits against the ethical costs. A class of social robots – mobile robotic telepresence (MRT) systems – have already been shown to generate positive social interactions with elderly patients. MRTs are essentially video screens on wheels raised to head height that can be controlled remotely using a simple smartphone app. They allow relatives and social workers to “visit” elderly people more often, even if they live in rural or distant places. The elderly patient doesn’t need to operate the device, leaving them free to interact with their social worker or family. Communication still happens through a computer screen, but the robot’s physical presence mimics face-to-face interaction for elderly people. Research has shown that people reacted more positively when talking with someone through an MRT than through a regular video call or computer avatar – especially lonely people. However, MRTs still require a human operator, which limits the amount of social interaction seniors can have daily. Is it possible to design cities to combat loneliness? To tackle this, developers worldwide have started creating robot companions programmed with advanced artificial intelligence (AI), which can interact with people on their own. Some examples include pet-like companion robots including Aibo and Paro, which are made by Japanese developers, and MiRo, which is manufactured in the UK. 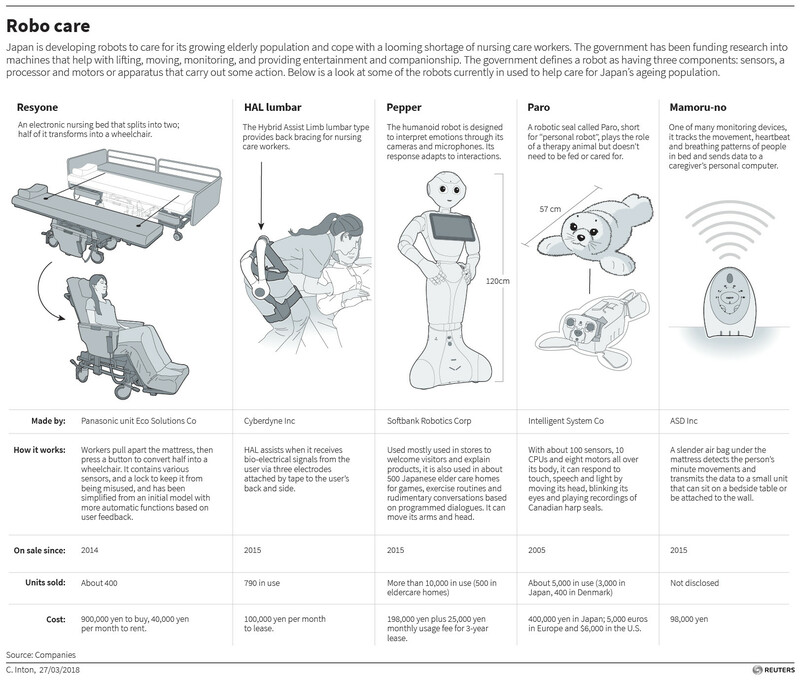 Other humanoid robots, such as the Care-O-bot and Pepper, are able to provide more complex and comprehensive care. Though “pet” robots offer limited interaction, they have proved as effective – or even more so – than real pets in reducing loneliness for elderly people in care homes. Robotic dogs introduced in one UK care home this year were reported to bring happiness and comfort to residents. On the other hand, humanoid robots are already advanced enough to provide much-needed care to elderly people. These robots can pick things up and move independently, and have a more natural, human way of interacting (for example, using arm and hand gestures). More advanced versions have additional sensors and devices, including touchscreens. Many elderly people, finding the touchscreens hard to use, preferred giving spoken commands to the robot and reading its response off the screen. But for those with age-related hearing loss or vision impairment, having the option to use the touchscreen was indispensable. Humanoid robots are still being developed, so their capabilities are still limited. And studies of humanoid robots have mainly focused on evaluating how well the technology functions without really considering the social impact. There is also a general assumption that it will naturally reduce loneliness. Though research into social robots is just beginning, we do know they can provide some solutions to the challenges mounted by ageing populations, and could even help reduce social isolation and loneliness. At this point, humans are still better in providing care and social contact to the elderly, but robots might be able to fill any gaps, especially as technologies continue to improve. However, before social robots can be fully integrated into care homes, researchers and service provides must address public anxiety and make it clear that robots are designed to assist social workers, not replace them. As long as humans remain in full control to prevent any danger, robots might well be the future of care.